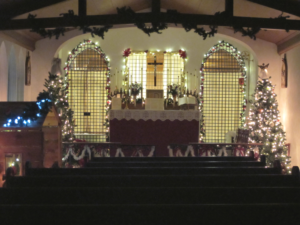 View of our chapel, decorated for the Christmas Season. 7:25 After a small breakfast in the Refectory and a short space of time to prepare for the day, the Sisters meet again in the Choir to chant Lauds, glorifying God for His beautiful creation. Seven times throughout the day they will come together for the Divine Office, to sing the Psalms in praise of the Most Blessed Trinity, joining in the unending hymns of worship of the Heavenly Court. 7:45 Holy Mass follows Lauds. Assisting at the Holy Sacrifice from behind the grilles, the Carmelite unites herself to Jesus Christ, offering herself to Him with all her love, for the redemption of all mankind and in return for his tremendous gift of Himself for us all. Following Mass is a period of Thanksgiving and then the hour of Terce. After Mass, the Sisters disperse and each one goes about her appointed duties for the rest of the morning. One Sister cares for the Sacristy, purifying the sacred vessels and ironing altar cloths; another answers the Turn to speak to visitors and receive gifts of food and other items; another bakes bread, and all take turns cooking. Many Sisters are kept busy sewing, whether it be habits and veils, or vestments, or scapulars. Great care is taken in the cleaning of the Monastery that it might be always a neat and worthy home for the Holy Family. The Mother Prioress carries on correspondence that extends over the United States and beyond, and lovingly guides her daughters in even the smallest matters, both practical and spiritual. All this work is performed joyfully and with as few spoken words as possible, that the soul may more easily remain mindful of the loving gaze of God. 11:00 The bell rings and the Sisters gather in the Choir to chant the hour of Sext, followed by the midday examination of conscience. They also make a visit to the Blessed Sacrament to thank Our Lord for all His gifts and to unite themselves to Him lovingly in a Spiritual Communion. They then process to the Refectory to take their main meal of the day. The Carmelites’ diet consists mainly of eggs, fish, cheese, nuts, or beans, together with fruits and vegetables and some form of starch. The meals take place in silence while one Sister reads aloud from Sacred Scripture or another spiritual book, a reminder that the soul needs nourishment as well as the body. 12:00 p.m. During an hour of Recreation, the brimming cup of joy in each Sister’s heart is allowed to overflow, and the customary monastic quiet gives way to an outpouring of laughter and conversation. The Sisters gather in the Recreation Room or outdoors to converse with one another as a family, while keeping their hands occupied with some simple work. 2:15 In the Choir, the Sisters pray the Hour of None and then the Holy Rosary. Afterword, each Sister reads for half an hour from some spiritual author before continuing on with her work. Sometimes this reading is done as a community, so as to deepen our ongoing formation. The Novices at this time receive instructions from their Novice Mistress who lovingly guides them to imitate the virtues practiced by the Blessed Virgin Mary and her hidden life in Nazareth. 6:20 From the Choir the Sisters process to the Refectory for a light supper. The dishes are washed by hand while the Sisters recite prayers for the holy souls in purgatory. 7:45 Once more the Recreation Room fills with joyful merriment during this second period of Recreation. On feast days the Sisters might bring out musical instruments or sing together, or even perform a play. 8:45 Compline begins with the evening examination of conscience, when the Sisters thank God for the blessings of the day and consider how they might grow even more in love for God and their neighbor. This Hour of the Divine Office commends the Monastery and all of God’s children to the protection of the Holy Angels for a safe and peaceful night. 9:15 As night falls, the Sisters remain in the Choir to keep Our Lord company and to pray Matins, the final, and longest, Hour of the Divine Office, which consists of psalms as well as readings from Sacred Scripture and the writings of the Saints and the Church Fathers. The insignificant, unnoticed acts of self-denial that fill the Carmelite’s day from morning to evening can be compared to little brown seeds: they appear plain and useless, but within they hold an intense power to spread life. When a Carmelite offers her little, hidden acts to God with all the love of her heart, He receives them and in His hands, through His goodness, He sows them far and wide and raises up a plentiful harvest of graces and blessings for innumerable souls. The purpose, then of the Carmelite vocation, in a sublime and mysterious way, is nothing less than to be a co-redeemer with Christ, to save souls with Him. She offers her whole life as an immolation united to Our Lord’s sacrifice on the Cross, and by mingling her tiny actions with the infinite merits of His Passion, she draw down His redeeming grace on those for whom she prays…. all His children who live under His constant and loving gaze: priests, missionaries, families, the poor and the sick, those who as for her prayers and those who know not how to ask, so many whom, she will never meet until heaven. Although separated from the world by high walls and double grilles, it is precisely an immense love for that same world that has impelled the Carmelite to leave all things so that in solitude she might pray and offer her life with great love to win salvation for souls, desiring that all her brothers and sisters might come to know and love that God of Love Who has so captivated her own heart.